We make a range of handheld radiation detectors, these portable radiation detectors are specifically made for use in the field, and are designed to operate without the need of other equipment. They carry their own power, software, detector and display but can still be easily carried. Outside of the lab, you need handheld radiation detectors that can withstand being carried around, have low power requirements (so they last), require minimum maintenance, can operate at room temperatures (so you don’t have to carry around expensive and heavy cooling equipment) and offer you the sensitivity you need. Using CZT solid state and scintillation detectors we are able to make a range of small, portable and sensitive gamma-ray identification devices, but to be truly handheld the detector has to carry its own power supply, integrated gamma spectroscopy software and display. 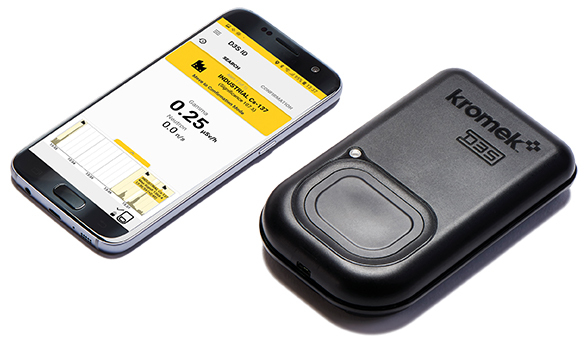 The RayMon10 (which has an option for quantitative analysis) is a handheld radiation detector designed for radiation professionals that need the best in one all-in device. It uses a GR1 detector in the probe so you get the radioactive sensitivity you need. Everything else you need is included with the rugged tablet running radioisotopic analysis, the large touch screen can be used with gloves or the inbuilt stylus, it has an inbuilt rear and front-facing camera for recording your findings, GPS function to identify where you are and the ability to output a complete report once you have access to a printer. It is the perfect all in one device for the radiological professional. 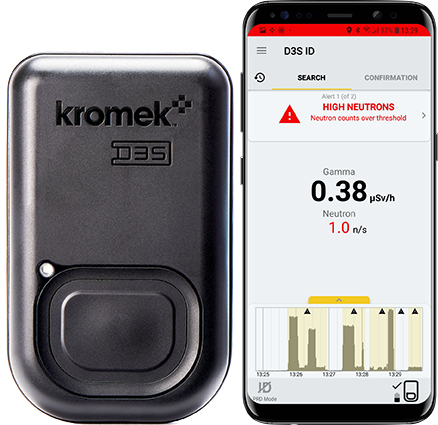 The D3S family of detectors was originally designed for security (CBRNe) applications and thousands of them are currently deployed protecting borders, VIPs and other locations and events. It is also used by civil nuclear workers, anyone that needs to identify radioactivity (scrap metal processors, researchers, etc.). The unit is light, portable and consists of a detector unit and a mobile phone running our radiation spectroscopy app. Both the detector unit and the phone are light enough to be easily carried in a belt pouch or a jacket pocket. The phone app provides an easy to understand clear readout of the isotopes and radioactive dose (activity) detected. The D3S also detects neutrons , so even a shielded radiation source can be identified. The phone can even be used to announce the findings using its speakers or an earpiece. Radioisotope library far exceeds ANSI and international standards. 37 isotopes – 17 more than ANSI N42.34 standard. 69 unique signatures which accounts for shielding and mixed configurations. The small but sensitive radioactivity detectors below can be easily carried in the hand and will fit into a pocket but they need separate power, software and display, however, all they need is a laptop or tablet running our gamma spectroscopy software. The laptop or tablet (running Windows 10) provides the power, software and display, plus the radiation detector units are small enough to carry in a pocket and can survive life in the field. The Kromek GR is the radioactivity detector unit mounted inside the probe of the Raymon10. It is one of our most popular gamma detection products because it is one of the world’s smallest, lightest, most sensitive, room temperature gamma radioisotope identifier. Built into the unit is a preamplifier, shaping amplifier, baseline restorer, pulse height digitizer, and HV – all in a metal case about the size of a lipstick. The GR1 contains a one-centimetre cube of CZT. Sometimes you need a scintillation detector rather than CZT. The SIGMA unit uses CsI(Tl) thallium activated caesium iodide scintillator crystal. SIGMA has two models, both can fit in a pocket. SIGMA-25, scintillation crystal volume 16.4 centimetre cubed. SIGMA-50, scintillation crystal volume 32.8 centimetre cubed. Perfect for taking out into the field, clients have used them on flying drones and ground rovers. SIGMA offers fast radiation detection in a small package. The power of a much larger, much costlier detector that can fit in the palm of your hand (equivalent to 100mm x 13mm Ø 3He at 4 atmospheres). The TN15 surpasses the performance of a 100mm long 13mm3 He tube at 4 atmospheres without the need for cooling. The TN15 neutron detector operates at room temperature and does not have all the associated running costs or problems of helium cooled systems.